"Our latest doorhanger order was very well received by the staff here. They looked even better than expected! I also love the ease of ordering and reviewing/approving proofs on-line and the customer service is top-notch." Picture this. Your prospect arrives home and gets out of the car. She checks the mail and absentmindedly rifles through a stack of uninviting junk mail. Then she goes to the front door, and slowly starts to turn the handle. But wait...something stops her in her tracks. Hanging on the door is the full color, professional-quality, eye-catching door hanger your company has strategically placed on the knob. Sounds like a marketer's dream, right? Door hangers are full of untapped marketing potential. They are the perfect vehicle for marketing your business locally and are one of the most inexpensive ways to get the word out a large group of potential customers. Full color, professionally-printed door hangers are easy to distribute and are effective because they are the first advertisement a consumer sees when he or she arrives home. We all know that even the best marketing campaigns are wasted without a relevant target. Ideally, your target should consist of people or businesses ready to buy your product or service at the moment they receive your door hanger. Door hangers are very effective at this because they allow you to target specific areas and demographics to help in increase your ROI. For example, if you sell fencing, you can deliver your door hangers just to the homes without an existing fence. Or if you sell renters insurance, you can target your door hangers to specific apartment complexes. Or, if you perform snow removal, you can focus on neighboring homes that do not currently use your services - and look like they could use it! Utilize your company staff to distribute your door hangers to your target audience. Enlist friends and family to help you out and reduce your distribution costs. Try turning it into a competition to see who can distribute the most door hangers in the time allotted. It will be fun and more effective than doing it yourself! 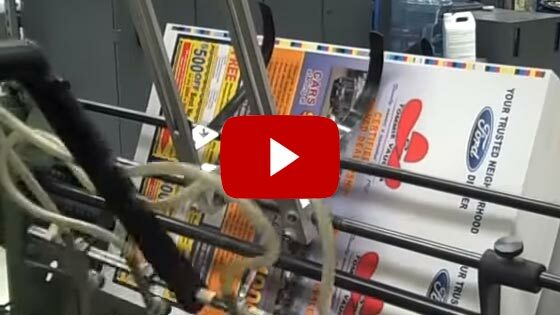 If you just can't find the time to do it yourself, outsourcing your door hanger distribution is also a viable option for many businesses. Consider this: An able bodied person should be able to distribute between 600 and 800 door hangers a day depending upon neighborhood concentration. Better get moving! As you can see the, the benefits to adding door hangers to your marketing plan are numerous. Not only are doorknob hangers perfect for reaching a specific target audience, they also allow you to hit your prospect at exactly the right time and are hard to ignore. Plus, your door hanger is likely to be carried into your prospects' home for a second look later on. 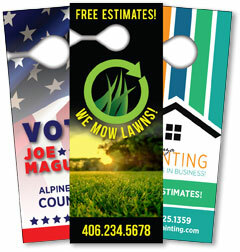 PrintingForLess.com offers affordable, full color door hangers in a variety of different formats and sizes. Choose from one or two-sided, in two popular sizes; the standard 4.25 x 11 or 3.5 x 8.5. We offer these on your choice of our three cover stocks or the more economical 100# gloss text. Ready to design your door hanger? Call our printing experts now at 800-­930-2423, or Request a Quote. Lots more door hanger samples showing different design and marketing ideas.